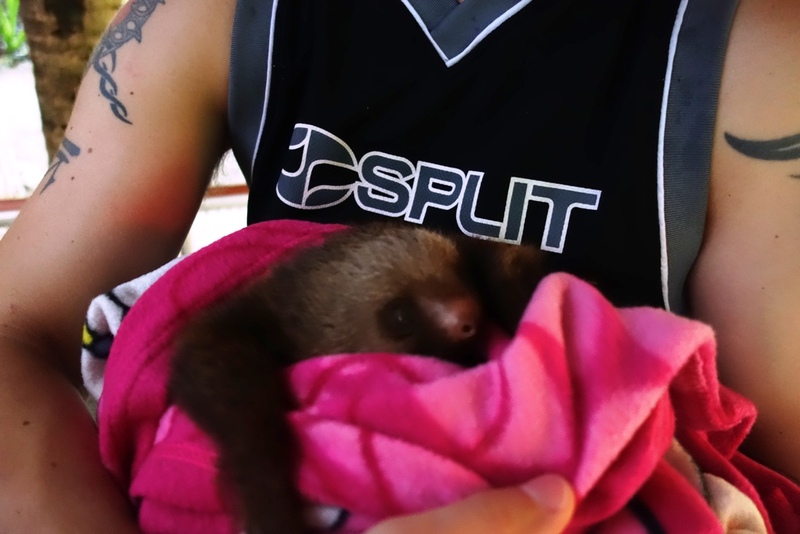 As promised, a little explanation about the sloths and what it is like to work with them! As I put this together, I realized I forgot to get a picture of my Sloth-BFF, Yare, so I will have to get one tomorrow and post later! 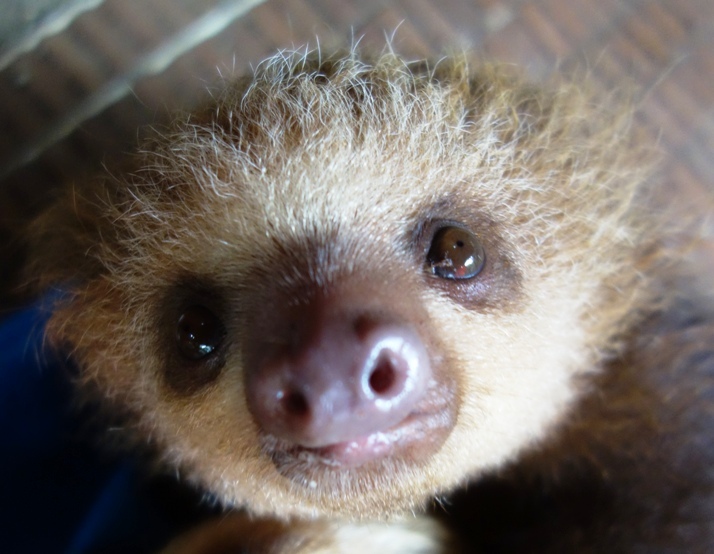 First off, sloths are mostly just as cute and cuddly as you would imagine. 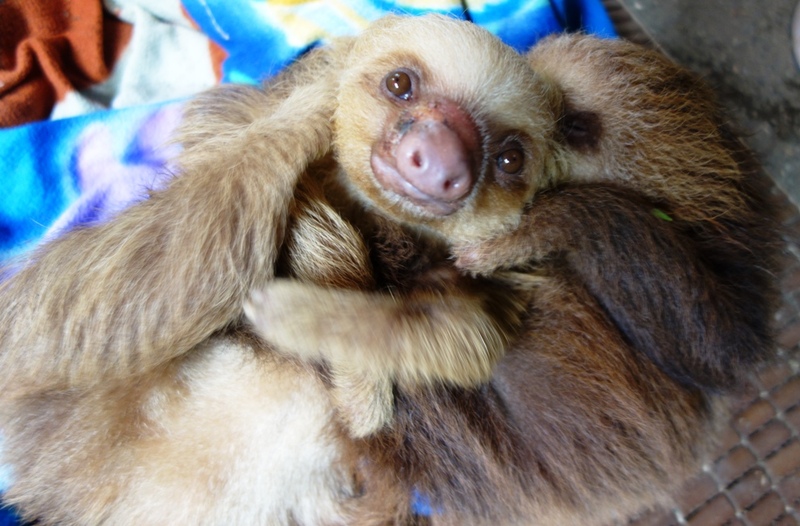 However, I did not know that 2 toed sloths (the babies mostly) were such aggressive little bullies. They actually reach out to bite – me, the Kinkajou, the Squirrel, the Agouti… Anyone! 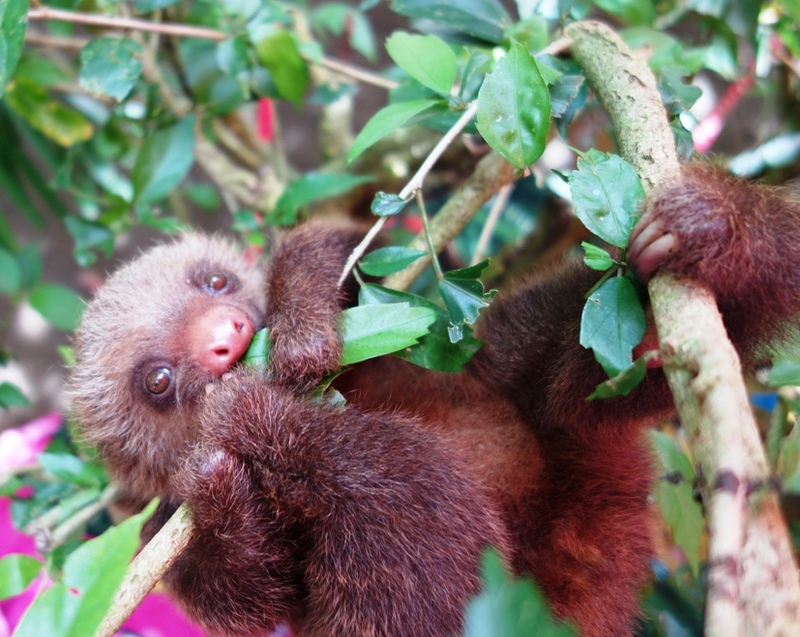 Sloths eat leaves in the wild; in the center we give them leaves and steamed veggies with vitamins. When they are hungry, they shove their faces in the food dish and eat like a horse. So let me introduce you to Charlie and Jeremy, the “inseparable brothas from anotha motha”. They both lost their mommies and were brought into the Rescue Center at about the same time. We suspect they are only days apart in age. 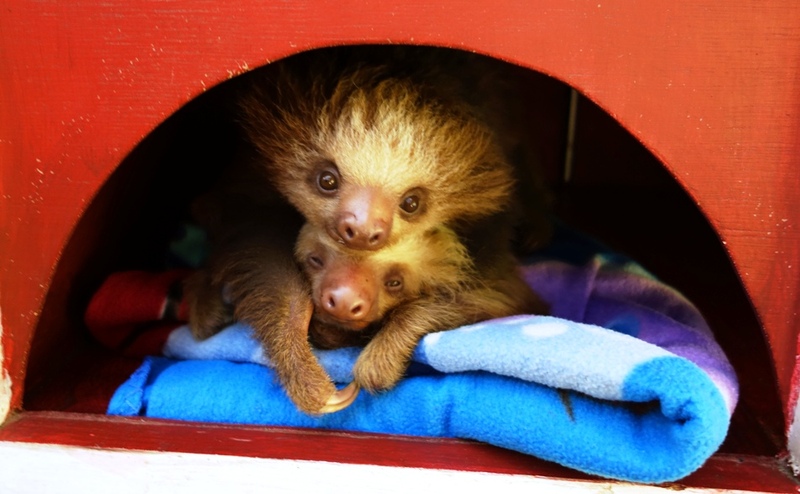 2-Toed babies spend the first ~18 months or so with their mom, so it is good that Charlie and Jeremy have each other for affection and body heat. I can only pick them up wrapped up in a blanket because all they want to do is bite me. 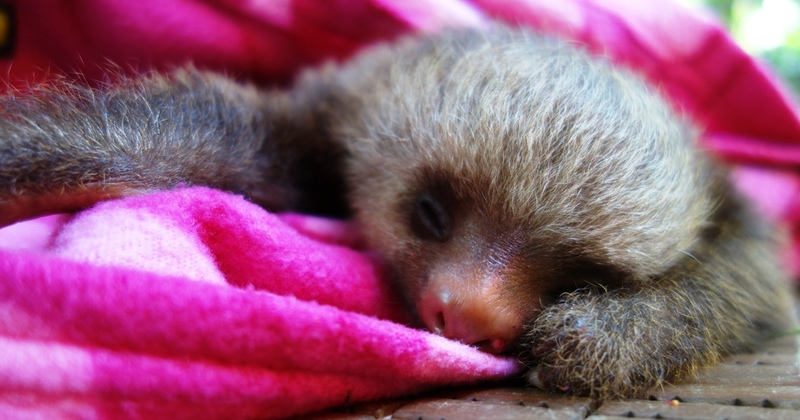 Baby sloth bites hurt! And now here is Carlo, whom I call the “baby baby”. He is only a couple months old and is teeny tiny. He is also quite aggressive, but he is so tiny that none of his attempts result in success. I like Carlo, and Carlo likes hibiscus flowers. That’s about it. And the new love of my life, Cuore. “Cuore” is heart in Italian. She is absolutely adorable and melts my heart like no other. How can you not love that face? If anyone doesn’t love Cuore, I’m officially dubbing you as emotionless. She is about 9 months old, and she also lost her mother. 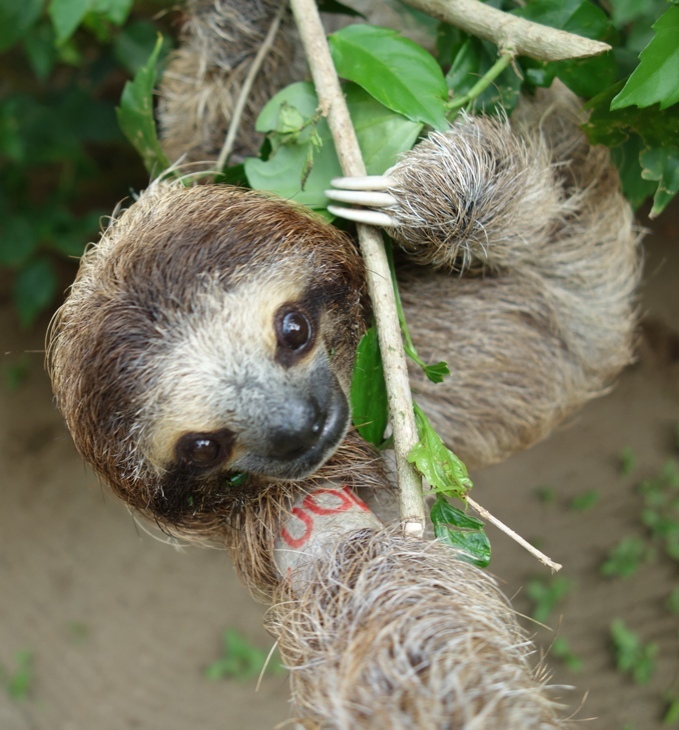 She is a 3-toed sloth; unfortunately she is now the only 3-toed at the center because we just lost Randi, the adult 3-toed a couple of days ago 😦 Anyway, everyone at the center loves Cuore. 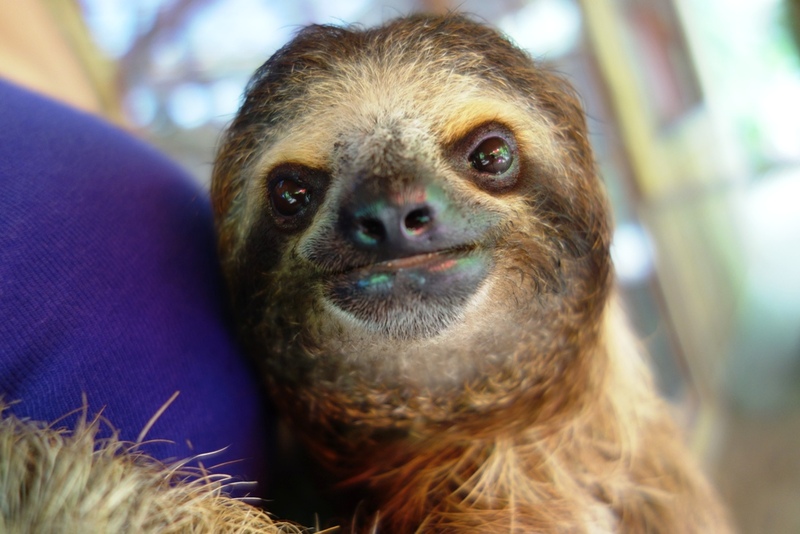 Unlike 2-toed sloths, 3-toed are not aggressive. I’m not sure if she likes being held, or if she simply lets us all hold her. She also likes to try to escape the nursery like 10 times every day. Here is DJ. 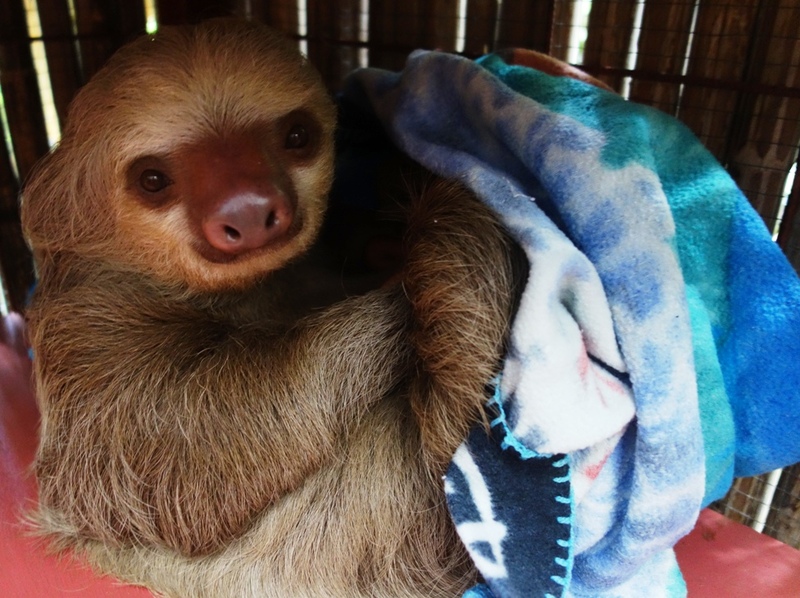 He is normally a released sloth, but he likes to come back to the center on his own as he feels safe… He is also showing symptoms similar to Parkinsons, so he’s staying with us for a while. I don’t interact with him much. 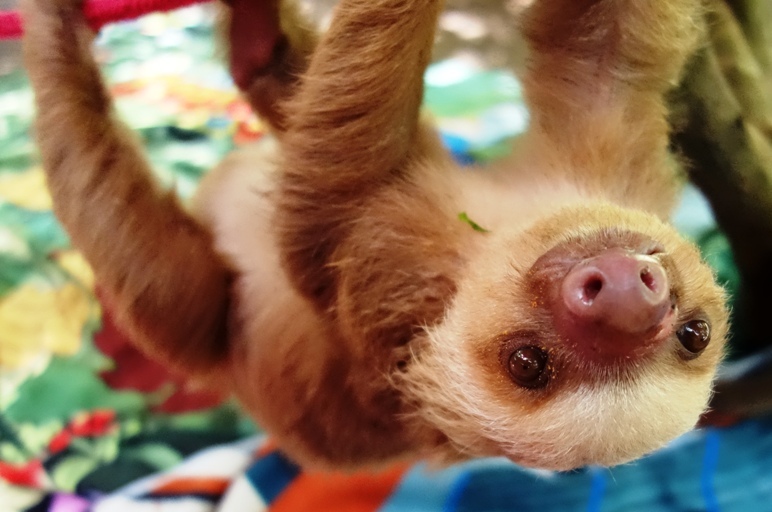 When I take care of the sloths, which has been most of my duty the ENTIRE time (boy, life is rough), I disinfect every single surface in their enclosures. 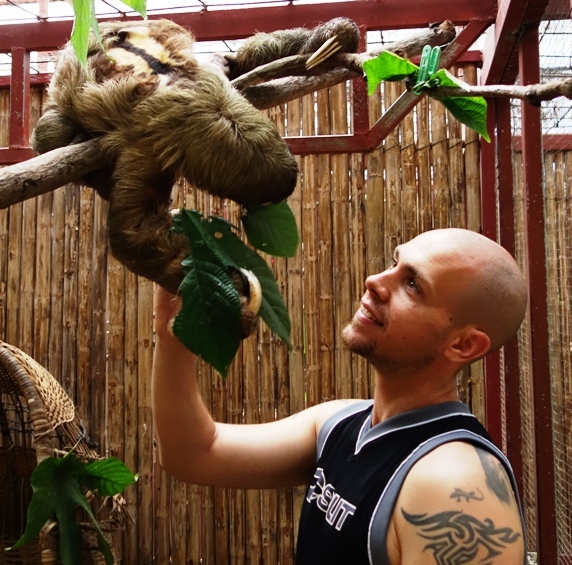 I clean up sloth poo (which is like little deer poo, and doesn’t happen as often). 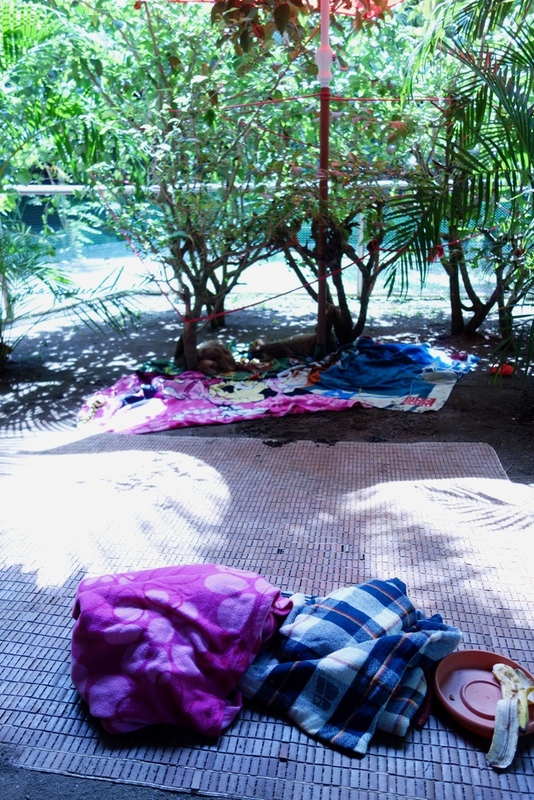 I rake the floor and take out all the leaves and food dishes from the previous day. I replace all their leaves with fresh ones. Then I get to bring all the animals out to the nursery to show the tourists! I bundle up Charlie & Jeremy in a blanket and then put them in a tree. I talk to Yare and get him to come to me (he really seems to like me now), he grabs on and I haul him out to a tree, too. Then other volunteers or staff bring me the Kinkajou, the squirrels, Cuore, and sometimes Carlo! I also sweep the center and wash all the windows, but that’s boring so you don’t care about that!